Ischemic colitis (also known as ischemic bowel disease) is a condition that tends to affect older adults and seniors. It occurs when blood is restricted from flowing into the colon. The results of this are typically uncomfortable, painful, and unpleasant to say the least. The abdomen hurts, especially after eating; stool may contain blood; and patients may even pass blood without having a bowel movement. As you might imagine, when suffering from ischemic colitis, you will want to do everything possible to help alleviate the symptoms. One of the things you can do is switch to an ischemic colitis diet. In this article, we’ll take a look at foods to eat with ischemic colitis as well as foods to avoid with ischemic colitis. This quick guide should help you maintain appropriate ischemic colitis nutrition, and keep the symptoms from punishing you too much. In general, many of us are conditioned to eat three meals a day: breakfast, lunch, and dinner. Breaking your meals up into smaller but more frequent ones allows additional time for your stomach to absorb and digest the food. Plus, you will still get the amount of food that you require for energy to make it through the day. Fiber can help greatly with stomach issues, especially in terms of firming up stool, which will help to rein in diarrhea. It can also boost your stomach’s overall health. Probiotic bacteria can help your gastrointestinal (GI) tract and make it a friendlier environment for digestion. You can elevate your amounts by eating more foods with probiotics, like certain types of yogurt (assuming you don’t have issues with dairy, which will be discussed in the next section), but you can also take probiotic supplements to help. Drinking plenty of fluids is great advice for you on a regular basis, but it can also be a very good idea if you are suffering from ischemic colitis. Drinking plenty of water can keep the digestive system flowing as well as get rid of waste through urine. As diarrhea is a frequent symptom of ischemic colitis, drinking plenty of water can help with the possible dehydration you may suffer as a result of diarrhea. For stomach issues, applesauce is typically the first food to come to mind. But in reality, the fruit you should really be thinking about is bananas. Bananas are soft, have a good amount of fiber and are easier to digest than apples. While bananas may be better than applesauce, applesauce is still a good food for when you have ischemic colitis. Applesauce contains fiber but also has anti-inflammatory properties that can help soothe the colon and make things a little easier on you. Coconut water contains many beneficial ingredients, and it may also aid the colon if you are suffering from ischemic colitis. The refreshing drink may work as a natural laxative by hydrating your body and boosting your electrolytes with potassium, which will help keep those bowels moving smoothly. Protein is important to the body. However, a lot of meat proteins are harder for the body to digest, especially when you are suffering from ischemic colitis. Try proteins like tofu and white fish, which can give you that protein value but are much easier for your system to digest and less pressure on your colon. Watermelon contains chromoprotein citrulline, which can help get blood circulating in the colon and help make things run more efficiently. Because of this, watermelon can not only help while you are suffering from ischemic colitis, but also can help prevent it as well. Buttermilk is filled with potassium, vitamin B12, calcium, riboflavin and phosphorus and low in fat, which makes it a good candidate for any diet. But it is also much better digested than regular milk. These are some of the best tips we can offer on what to add to your ischemic colitis diet plan. But to help you out even more, here’s a quick food guide of other items your body might be able to easily digest when suffering from ischemic colitis. As there are foods that are great for your stomach while you are dealing with ischemic colitis, there are also a number of foods that you should avoid. What you want to avoid are foods that tend to cause excessive gas and are difficult for the body to digest. Alcoholic beverages tend to cause excessive gas in combination with difficult digestion. It is best to avoid alcohol altogether when dealing with ischemic colitis, but it is imperative that you not consume alcohol in excessive amounts when dealing with ischemic colitis. Similarly to alcohol, caffeine-based drinks can help increase chances of diarrhea, create excessive amounts of gas, and are harder for the body to digest and process. Many people find that dairy products are hard to digest and produce negative side effects in the bowel system (gas, bloating, cramps, etc.). This is the last thing you want when dealing with ischemic colitis. That being said, some dairy products, such as the aforementioned butter milk and probiotics-based yogurt, could actually help the situation. The best advice is to steer clear of dairy if you have had any prior problems with lactose. If it has never been an issue for you, approach dairy products with caution. Fried and fatty foods hit all the wrong markers when it comes to ischemic colitis. The contents tend to be tough to digest. Depending on your digestive system, they can create excessive gas and cause diarrhea. Beyond those reasons, they also tend to be higher in cholesterol. Therefore, it’s recommended to skip them while dealing with these digestive issues. Spicy foods have a nasty habit of creating excessive gas as well as aggravating the GI tract with heartburn or ulcers. Many people have adverse reactions to spicy foods at the worst times. One very unfortunate thing about ischemic colitis is that it is exacerbated by excessive gas. As we’ve seen above, this eliminates a number of foods that aren’t particularly healthy for you anyway, but it can also cut out certain vegetables that you would otherwise be encouraged to eat due to their nutritional value. As such, it’s a wise idea to stay away from vegetables like cabbage, Brussels sprouts, beans, broccoli, and cauliflower. Citrus fruits and juices tend to have a high acid content, which can cause trouble for your stomach. Any existing digestion issues caused by ischemic colitis will only become worse and, with exposure over prolonged periods, you may develop stomach ulcers. You may have noticed that the appearance of the corn you eat doesn’t change much upon exiting the body. That is because corn is hard for the human body to digest, and it can often travel your entire digestive system intact. As you can guess, this is not ideal if you are suffering from ischemic colitis. Popcorn should also be avoided as the kernels also may not digest properly. We know this is a lot to take in, especially in addition to any information your doctor may have already given you. With that in mind, here’s a quick and handy list of foods you should try to avoid. 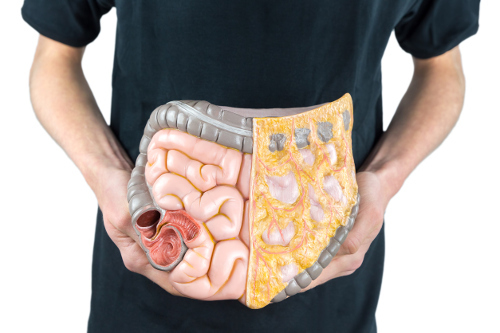 Ischemic colitis is not pleasant and can make your body react in embarrassing ways. Luckily, there are several simple treatments for it that your doctor should go over with you once you’ve been properly diagnosed. In the meantime, these diet tips should help relieve your symptoms and make your recovery period slightly more bearable until the ischemic colitis clears up. Once the colitis is taken care of properly, you can return to eating some of the healthy foods we have listed above. Singha, R., “Ischemic Colitis Diet,” Buzzle, August 4, 2016; http://www.buzzle.com/articles/ischemic-colitis-diet.html, last accessed July 14, 2017. “Ischemic Colitis Diet Plan – The Best Practice,” Top Diet; https://top-diet.com/ischemic-colitis-diet-plan/, last accessed, July 14, 2017. “Which Foods to Avoid When Suffering from Ischemic Colitis?” Ygoy; http://diet.ygoy.com/2011/10/19/which-foods-to-avoid-when-suffering-from-ischemic-colitis/, last accessed July 14, 2017.